LoCARNet arranged the policy dialogue in Bangladesh particularly to demonstrate and discuss possible analytical methodologies and quantitative tools for policymaking. 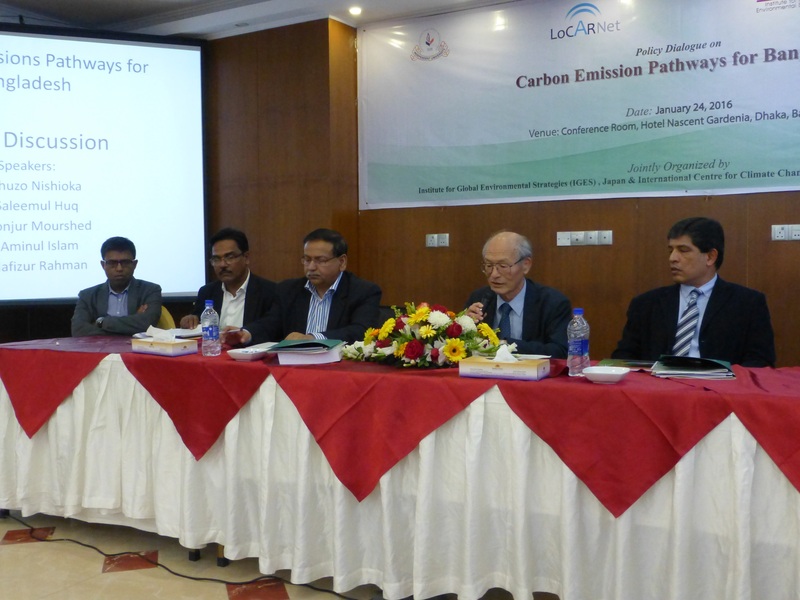 IGES, as the secretariat of LoCARNet, organised the policy dialogue in collaboration with the International Centre for Climate Change & Development (ICCCAD) in Bangladesh. Bangladesh, which is one of the most vulnerable countries facing the adverse effects to climate change, needs special global attention particularly for adapting to climate change. At the same time, the country needs to reorient and reshape its policies and priorities for low-carbon development. This is particularly important given that the country has shown very impressive growth and development in the last couple of decades, and the trend is likely to continue in the coming years. With growth, its use of energy and other resources will also increase significantly. It is therefore high time for the country to adopt and strengthen its low-carbon development policies. A panel session followed the two thematic sessions to propose the next steps in integrating researchers from different disciplines and enhancing dialogue among research communities and decision-makers in the future. In the first session, speakers explained Bangladesh’s climate and environment related policies, submitted INDCs, the significance of policies in combatting climate change, and the role of research in climate policymaking. 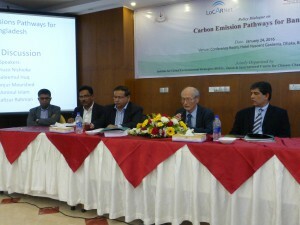 The session was chaired by eminent Professor Ijaz Hossain from Bangladesh University of Engineering and Technology (BUET), who stressed that initiatives such as joint crediting mechanism (JCM) could be useful for promoting appropriate technologies and supporting shift towards a low carbon society in developing countries such as Bangladesh. In the second session, chaired by UNDP’s Senior Advisor Dr. Aminul Islam, several analytical methodologies, including the AIM-Enduse model as well as 2050 Calculator models from Bangladesh and Japan were presented. Dr. Toshihiko Masui from NIES also explained his institutes previous works in Bangladesh relating to studies on low carbon development in the country. The Bangladesh Calculator, presented by the developer Dr. Monjur Mourshed of Cardiff University, explained the technical details whereas Dr. Mustafa Moinuddin from IGES explained the innovative features for policy analysis in the Japanese Calculator that could potentially be incorporated in the Bangladesh Calculator. This session also included a presentation on low carbon technology assessment. This is based on and IGES project together with the Centre for Energy Studies (CES) of BUET. The presentation, done by Dr. Obaidullah of CES, focused on the overview of the project, identification of priority technologies for Bangladesh, and the preliminary findings. At the end, Dr. Saleemul Huq, Director of ICCCAD, explained his institute’s activities on how to bring research and capacity building to the policymakers. He stressed on the need for regular interactions—the “learning hub” events of ICCCAD—as an effective tool for bridging research and policymaking. During the panel session moderated by Prof. Shuzo Nishioka of IGES, several discussants and participants observed that social and cultural issues are also quite important when considering climate change mitigation, particularly because of the need for behavioural change. Prof. Mofizur Rahman of BUET emphasized the role of the water sector and its implications in emissions pathways for countries like Bangladesh. Prof. Nishioka also noted that the image of the society that we envision for the future is also equally important. Finally, Dr. Saleemul Huq noted that 2016 will be a pivotal year for the wold in general and Bangladesh in particular. Highlighting the outcomes of the COP21 and the Paris deal, and the adoption of the SDGs, he expressed his expectations for Bangladesh’s move towards a positive direction in achieving a low carbon society.